Entrance to the Garden is obtained through death. The Bride enters as a dead woman, her life poured out as a drink offering before Him. The same exceeding greatness of His power, which He worked in Christ when He raised Him from the dead and seated Him at His right hand will be exerted in The Bride. She is raised and seated together with Him in the heavenly places. Previously incomplete, she now becomes His Fullness – the Fullness of Him who fills all in all. As The Bride comes forth, the mystery and manifold wisdom of God hidden from the foundation of the world will be made known by her to the principalities and powers in the heavenly places. Jesus referred to one such mystery in a parable. He said God provides seed to the sower, but unless that seed dies and falls to the ground, it remains alone. Only after it dies, does it produce a harvest. Brethren, our lives are seeds given to us by God to be sown. Until His Body – the Bride – dies, there can be no harvest! God gave me a vision of a time when the very last member of His Body enters the Inner Chamber. His Bride now complete, will stand to her feet! By her death, the word of her testimony is activated. She is beautiful and strong, with light of God emanating from within her. All power and authority is given her to go forth. 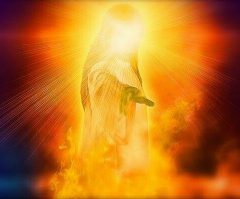 This will be when it is heard, “Who are these, and where did they come from?” The Bride will be used in the midst of the coming calamities, to bring in the greatest harvest of souls in history! I pray we fasten our eyes upon Him and heed His urgent call to ‘Come to The Garden.’ I pray everyone reading this message will be one of His Hidden Ones! All scripture references have been included below. Please pray over this message for confirmation and revelation of how this may apply to you. This entry was posted on Monday, December 17th, 2018 at 11:13 am	and is filed under Bride/Bridegroom, Dreams / Visions / Words. You can follow any responses to this entry through the RSS 2.0 feed. You can leave a response, or trackback from your own site. I’m looking to see when I ordered the “Hidden Ones” by Jessie Penn Lewis also sent to a friend. Psalms 24:all (note 7-end)! Amen, dear Brother! You have make some very good points. I sent you my private email. God bless!